Orcas are highly intelligent and social non-human animals. They, and many of their cetacean kin, such as bottlenose dolphins, are able to pass the ‘mirror test’, i.e. recognize their own image in a mirror. Images in mirrors are abstract representations of one’s physical self. The ability to recognize and identify with such an abstract representation indicates orcas also have an abstract mental representation of themselves. Former orca trainer John Hargrove notes  (p. 137), that Takara ”liked” viewing herself and other orcas on a large display screen, including in instant replay. The ability to recognize and identify with representations of oneself and others is a salient feature within a considerable body of evidence that orcas fulfill reasonable criteria for ‘personhood’, and – in the tradition famously championed by German philosopher Immanuel Kant – ought to be treated with the dignity of ‘persons’. Many of the orcas described in our recent paper  are still alive and in captivity. It is our desire to see them – and all captive orcas and cetaceans – treated in as dignified and humane a manner as possible in the years to come, including retirement to seaside sanctuaries, or reunion with their natal pods. While Katina and Kasatka were both wild born, they are mothers and grandmothers of a majority of SeaWorld’s captive born orcas. Although any form of captivity is far from ideal, less harm would result if they remained with their offspring for the remainder of their lives. In addition to allowing them to remain with their kin, with regard to the optimal psychological health of Katina and Kasatka, we believe it could be beneficial to reestablish unstructured relationships with humans, possibly including their old petting pool friends in addition to full-time staff, if they spent time in seaside sanctuaries (as opposed to being released fully into the wild). 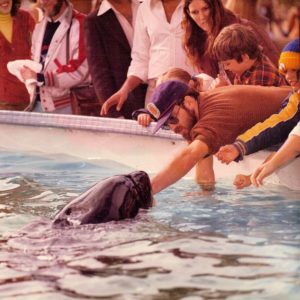 If unstructured relationships were reestablished in a sanctuary environment, one way to reunite the orcas with their old friends from the petting pool days might be to display images of the friends, as well as imagery of the old petting pool environment, possibly on a large video screen, preferably dating back to the late ‘70s and early ‘80s when the old relationships were established. Then if there were a reaction to an image, if the orca-friend was actually physically present, the friend could attempt to initiate contact, perhaps reprising old body language used at the petting pool. It might be logistically challenging to reinvigorate these old relationships, but it could prove beneficial for the un-releaseable orcas to experience completely agenda-free interactions with humans that they once knew. In their future freer state, once-captive orcas will require far greater levels of respect than they have experienced in prior decades, and among many aspects of affording them greater respect, food should not be used as a reward – only affection and attention. The orcas have had their lives and cooperation controlled and coerced too much by food. There is evidence that this may be a sensitive issue with them, and may have triggered negative interactions in their past “trained” lives. In the not-so-distant future, especially if orcas are given the freedom and dignity that they deserve in seaside sanctuaries, it seems that there will be a tremendous opportunity to more deeply explore orca social cognition, in support of acquiring sufficient evidence to implement within policy and legislation the concept of orca personhood. An important aspect of self-awareness is the ability to project the abstract concept of self both backwards and forwards in time. It is this ability to contemplate oneself in the future that likely generates additional suffering for highly intelligent beings in captivity. It would seem that the ability for Takara to take an interest in viewing herself in instant replay demonstrates projection of self into the past. But what research approaches might add to our knowledge of whether orcas can project their abstract selves into the future? If an orca can recognize herself in video replay, what about in some virtual reality setting? How close to real would a cartoon or caricature orca (or a familiar human) have to be, to be recognizable? Learning the answers to these questions alone could occupy many years of research time. Imagine orcas and people in a sanctuary environment with ‘virtual reality’ perhaps in the form of a large video screen, visible to all present. On the video screen would be controllable human and orca characters in a setting resembling the sanctuary. Initially real human X might cause virtual reality human Y to do something in the virtual sanctuary, quickly followed by real human Y replicating the virtual behavior in the real sanctuary. If an orca could control the virtual reality, would they grasp the concept and then virtually direct/request the future behavior of orcas or humans? This might provide evidence of an ability to project an abstract mental concept of both self and humans into the future. What kind of ‘joystick’ could an orca utilize? The petting pool orcas demonstrated remarkable control of small sardine/anchovy-sized food fish. They could manipulate them with their tongues, and also manipulate them both inside and just outside their mouths by moving water around with jaw and tongue motions. Perhaps an orca joystick would take the form of a tethered, flexible object that could be likewise manipulated (at the risk of creating orca-couch-potatoes!)? Major video game manufacturers might jump at the chance to build such a system! Consider another possibility. Suppose the virtual reality was a human’s visual concept of what an orca’s echolocation perception was like. If the orca had some ‘Photoshop’-like controls to change the nature of the visual concept, could the orca more accurately represent the perception? These are rudimentary and perhaps fanciful ideas, and if such research is not deemed to be in the best interest of once-captive orcas, then it should not occur. But, provided the freedom and dignity of the orcas is always maintained as the first priority, there could be many new insights into non-human intelligence and cognition that could be learned whilst fulfilling the ethical imperative to transition captive orcas to better lives. Hargrove, J.; Chua-Eoan, H. Beneath the Surface; Palgrave Macmillan: Basingstoke, UK, 2015. 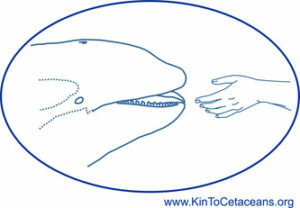 Visit kintocetaceans.org for more information and ideas from the authors. The ability to contemplate oneself in the future likely generates additional suffering for orcas in captivity. It could be beneficial for orcas to experience agenda-free interactions with humans that they once knew.